Helsby runners who participated in the Whitley 10k may be especially interested. Special mention surely goes to Lesley Feakes having a storming run to finish 6th overall (combined) in these results. The mens team is currently in 8th place, and ladies in 4th with Carol Shaw currently in 17th place overall in Cheshire! A great run from Danny, certainly putting Helsby on the map which also secured him a podium position! Please find attached a link to the full results for the 2nd Fell Counter, Llantisilio, which was jogged, walked, scrambled and with plenty of downhill action too lots of fast running. Beginning and finishing at Rhewl from the 14th Century Sun Inn. Helsby runners positions and times below, and what brilliant running by Danny to finish in 6th place in what was also a third counter in the WFRA North Wales Series so some strong runners were there. 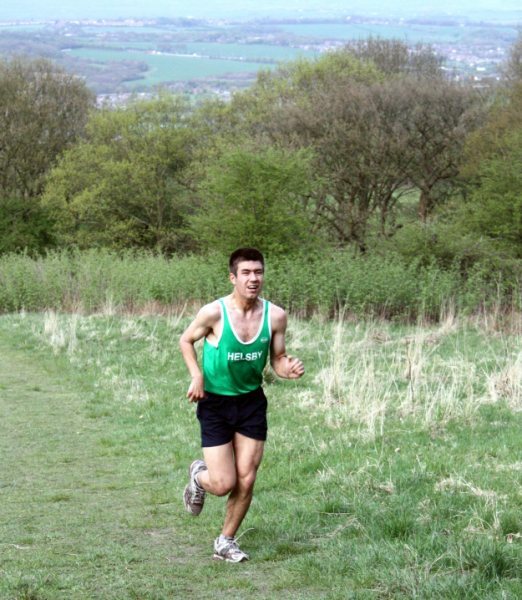 Well done also to Andy Robinson competing in what was his first Fell Race for Helsby. On checking my diary, I realised that a walking weekend staying at a basic mountaineering club hut in the upper reaches of the Newlands valley, 4 km from Stair clashed with this years Aniversary Waltz. Having secured an online entry a few days before, on Saturday I quickly swapped walking boots for running shoes and jogged down on a warm sunny morning to arrive at the start line just in time to see the start of this year’s inaurgural ultra race “A Teenager with Altitude”. The “Waltz” is 11.5 miles and 3600” taking in Robinson, Hindscarth, Dalehead, High Spy, Maiden Moor and Cat Bells, whilst the “Ultra” is 15.4 miles and 7600′ and takes in Causey Pike and Grasmoor first! Plus, whilst the main races are underway there are a number of junior races U10, U12.. U18. The village hall was bustling with runners picking up their numbers and ladies serving hot tea and an amazing range of homemade cakes. I happended to mention that the best would be gone by the time I returned, to be told that I could reserve one. So I selected the biggest piece of chocolate cake ever and it was put behind the counter with my name on! At 11:30 the Waltz got underway, the flatish valley start was avoided as the route took you immediatley uphill to pick up a higher bridle way to the lovely Newlands church 2 km up the valley. The route pulls gradually up below High Snab Bank before climing very steeply (sometimes on all 4s) to reach the rocky NE ridge of Robinson. The summit cairn was a most welcome sight. A gentle down and a much less steep climb up Hindscarth followed. Then another gradual down and a shorter climb up Dalehead (this run was getting easier not harder!). Runners were taking various lines down to Dalehead Tarn so I just followed the most popular route. A steam at the Tarn outflow provided the only drinking fell water of the race (essential to combat the hot sunshine). Wayne (an ex-Helsby fell runner) was the most welcoming of martials on High Spy. An increase of pace over the very runnable terrain of Maiden Moor was followed by the last push up Cat Bells. A final, leg thumping, clock watching, descend ensured I came in under 3 hours (2:55). The best was yet to come … chocolate cake. But first there was more, lots of runners were sitting around in the sunshine eating platesful of delicious lancashire hotpot and red cabbage which was being dished out to all runners. Then on entering the village hall to claim my cake there was a bar set up and free Hawshead beer was being served to all! A few pastic cupfulls later and feeling fully fortified I made my way back up the valley to our remote mountain hut (with no shower), bathed in the river and awaited the walkers return to exchange stories of a memorable first proper summer’s day of the season. Photo – Only Cat Bells to go. A misty start to the morning with a blue sky acting as the perfect ceiling to Spring welcomed the Helsby runners embarking on the country lanes of Whitley on Sunday morning. Results are already out and available on Spectrums website. Great support from Joe as always and thanks to Phil Gillard for popping up in various places on his bike. Really helped at the end! The world’s greatest sporting events are coming to London! Tickets for the London 2012 Olympic Games and Paralympic Games will go on sale in 2011. You can make a start by registering your interest with us. Helsby Running Club member Liz Dobson, Sport and Deep Tissue Massage Therapy Runcorn, is offering a discount of £5 on all treatments (excluding block bookings) for Helsby Running Club Members. Liz can also be contacted on 01928 715259 or 07507 518854. Helsby’s Gareth Boyd takes 1st place in Cheshire!! Attached are the handicap results for the first Cheshire GP race of the season, the Chester Spring 5 mile. Congratulations to the two winners, Gareth Boyd of Helsby RC, who won the handicap on the Pie and Peas race last August, and Christine Geraghty of Wilmslow RC who each improved on their recent best form by 3 handicap codes. Cheshire County AA are again providing handicap prizes to the male and female handicap winners for each of the 7 GP races in 2010 as well as a plaque to the overall points winner at the end of the season based on the mixed handicap results. For this season I have tightened the time scale for the minimum of 3 races to qualify for the handicap from 24 to 18 months. Any road races, not just GP races, count. Well done to Gareth from everyone at Helsby. Would Gareth like to share some words on his training regime…………. Summer has started! Monday night training sessions are now back on. 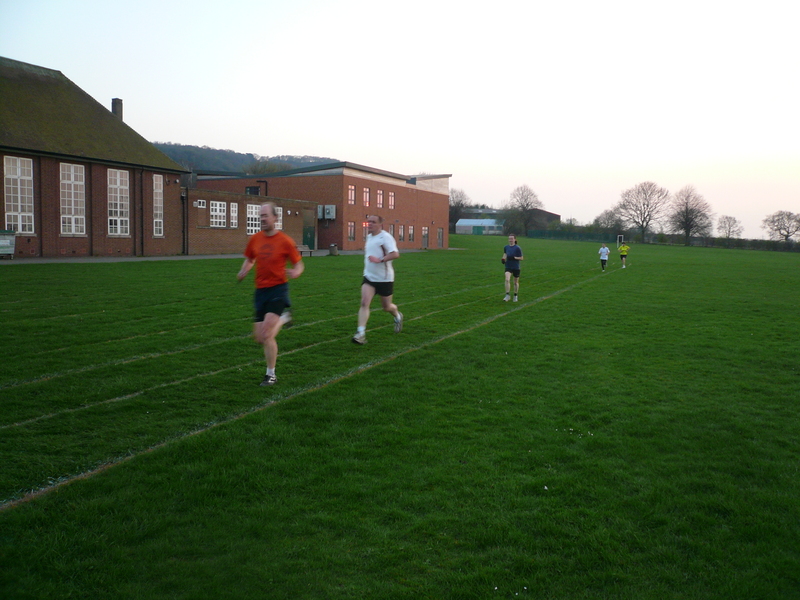 Meet at the grass track behind Helsby High School on Mondays at 7pm. Make your own way in. For anyone, new to track training don’t be put off. It’s as hard as you make it — we’re certainly not all fast — and the sessions are arguably more beginner-friendly than the regular Wednesday runs. After all you’re never more than 200m from the start! See you there.